We recently came across this video of the first segment from "Mike and the Mad Dog" first show simulcast on the YES Network ten years ago. The first topic of discussion that day, if you can believe it, was the Rangers trade for Pavel Bure, which had been completed the previous night. If you've forgotten how different the NHL was back in that pre-lockout era, go ahead and watch the video. The trade was more or less a salary dump: The Rangers received a player who, when healthy, was still considered an elite goal-scorer, but were able to make the trade because they could afford to take on Bure's massive salary without really blinking. (Via the CBC, Bure was slated to earn $10 million in 2002–03 and 2003–04, and $11 million U.S. in 2004–05.) Oh, how different the world was in 2002. Today, of course, teams have to consider the salary cap not just for a given season, but for years into the future. Teams like the Rangers can still take on large contracts, but must be careful when doing so. This is also a more critical time for the Rangers: Back in 2002, they were hoping to bring in Bure to make a playoff push that would eventually fail. These days — with the team atop the Eastern Conference standings — they can dream bigger. And so with Rick Nash on the market, Glen Sather must decide whether trading for him makes sense for the organization, factoring in all sorts of things from financial consideration to how much it would hurt to lose certain prospects. And like we wrote the other day, he really needs to play this right. Sources familiar with the parameters of the discussions between Sather and Columbus counterpart Scott Howson have told The Post the Rangers have designated Ryan McDonagh, Michael Del Zotto, 2009 first-rounder Chris Kreider and 2011 first-rounder J.T. 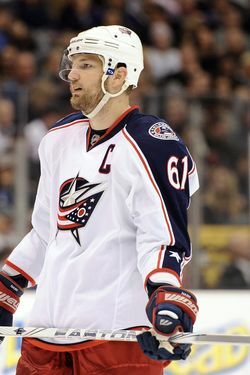 Miller as untouchables when the Blue Jackets requested their inclusion in the package for Nash, the 27-year-old power winger who is being dangled to deep-pocket contenders. It is believed that Sather, who is not fazed by the ramifications of adding Nash’s contract that runs through 2017-18 at a cap hit of $7.8 million per year, is prepared to send Brandon Dubinsky, Christian Thomas, and perhaps 2010 first-rounder Dylan McIlrath plus a first round pick to Columbus in order to bring the 6-foot-4, 220-pound, nine-year veteran to Broadway. Sather has been unwilling to include promising 20-year-old defenseman Tim Erixon — who could be a call-up for the playoffs — in the package going to the Blue Jackets, though Howson has expressed interest in the rookie North American pro. One thing that jumps out here is Sather's willingness to add Nash's contract, which could have been a dealbreaker. In a potential trade, the Rangers would have to not only put together a package that's attractive enough to Columbus for them to part with their franchise player, but also determine whether Nash's contract fits with what they're trying to do, especially with players like Ryan McDonagh and Derek Stepan due for raises in the coming years. But if Sather is indeed comfortable with taking on that contract, then it becomes a question of whether he can assemble a good enough package. It's encouraging to hear that Sather is hesitant to include some of his most prized prospects in a potential deal. In fact, we'd agree with Brooks that if the Rangers don't budge and include the likes of Kreider or Erixon — or include a quality NHL player in addition to Dubinsky — it might not be enough for Columbus. And that's fine by us. Where we disagree with Brooks is that the next two games will have an impact on Sather's decision-making. This is a franchise-altering move, that would involve a huge financial commitment and would surely cost them players with talent and promise. Sather might decide that the franchise is better off (now and in the future) if they make a trade for Nash, or he might find that the asking price is just too high. But we really do believe he's basing that on not just a season's worth of data, but on the way this team has progressed over the past few years. It's possible, when the team was in the middle of their recent 8-1-1 stretch, that Sather believed they were an elite scorer away from contention. And whether you agree with him or not, that's his decision. But we find it hard to believe that he'd be comfortable with his team following an 8-1-1 stretch, and would change his mind because of a slump that followed it — a slump you could argue was inevitable, considering how well they'd been playing. Look at it this way: If the Rangers were to lose Friday and Saturday, would Sather be more compelled to make a blockbuster trade than he would be if they won Friday and lost Saturday? We'd hope not. Whatever Sather ends up doing, at the very least we hope it's not done out of panic.